Denfeld, D. Colt. Hold the Marianas: The Japanese Defense of the Mariana Islands. White Mane Pub. 1997. ISBN 1-57249-014-4. Dull, Paul S. A Battle History of the Imperial Japanese Navy, 1941-1945. Naval Institute Press. 1978. ISBN 0-87021-097-1. Gailey, Harry. The Liberation of Guam 21 July - 10 August. Novato, California, U.S.A.: Presidio Press. 1988. ISBN 0-89141-651-X. Gailey, Harry. Peleliu: 1944. Nautical & Aviation Pub Co of Amer. 1984. ISBN 0-933852-41-X. Goldberg, Harold J. D-day in the Pacific: The Battle of Saipan. Indiana University Press. 2007. ISBN 0-253-34869-2. Hallas, James H. The Devil's Anvil: The Assault on Peleliu. Praeger Publishers. 1994. ISBN 0275946460. O'Brien, Francis A. Battling for Saipan. Presdio Press. 2003. ISBN 0-89141-804-0. Ross, Bill D. Peleliu: Tragic Triumph. Random House. 1991. ISBN 0394565886. Sloan, Bill. Brotherhood of Heroes: The Marines at Peleliu, 1944 -- The Bloodiest Battle of the Pacific War. Simon & Schuster. 2005. ISBN 0743260090. Smith, Douglas V. Carrier Battles: Command Decision in Harm's Way. US Naval Institute Press. 2006. ISBN 1591147948. Wright, Derrick. To the Far Side of Hell: The Battle for Peleliu, 1944. Fire Ant Books. 2005. ISBN 0817352813. Chen, C. Peter. "The Marianas and the Great Turkey Shoot". World War II Database. [2005-05-31]. Hoffman, Major Carl W., USMC. Saipan: The Beginning of the End. USMC Historical Monograph. Historical Branch, United States Marine Corps. 1950 [2005-12-19]. 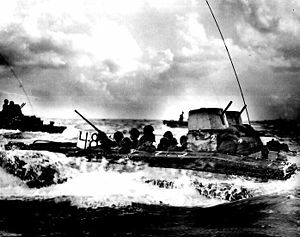 U.S. Army Campaigns of World War II: Western Pacific. CMH Pub 72-29, U.S. Army Center of Military History. 2003 [2004-11-03]. Chen, C. Peter. Palau Islands and Ulithi Islands Campaign. World War II Database. 2007 [2007-10-19]. Gayle, BGen Gordon D. Bloody Beaches: The Marines at Peleliu. Marines in World War II Commemorative Series. Marine Corps Historical Center. 1996 [2006-12-19]. Hough, Frank O. The Assault on Peleliu (The Seizure of Peleliu). USMC Historical Monograph. Historical Branch, G-3 Division, Headquarters, U.S. Marine Corps. 1950 [2006-12-19]. Smith, Robert Ross. The Approach to the Philippines. United States Army in World War II: The War in the Pacific. U.S. Army Center of Military History. 1996 [2006-12-19].